Babies just know they are cute. I'm pretty certain of this. If you'd like to see my other "Out To Work" outfits, click here. When you head out to work with ABM, are you able to bring your kids with you or has it changed a lot, making it so you have to find a sitter? It definitely has changed things a bit. My husband works from home right now, so he is able to step in and fill in the gaps when I'm not there. He's awesome. You look lovely. Love the hat! cutest mom ever! that mirror is uhmazing. and cute lil hat! Thats such a cute n comfy work outfit! I love your hat! Your outfit is so cute! so cute! i love your hat! Your outfit is adorable! Cute and comfy at the same time. I love your hat and the way you paired your socks with your shoes! Love this outfit! It is super cute and casual. And your daughter is adorable. Cute outfit! I love that you showed items from Asian iCandy. I've always wanted to shop there but was afraid I would order the wrong size. Did you have any problems with sizes from there? If you have any tips on picking sizes I'd love to hear them. I'm usually a us small. I understand! This tunic is a size Small. I would recommend just ordering your normal size, and if you are on the fence about something, order up. Their pieces sometimes run on the smaller side of the size. A cute work look indeed! Love the glasses! Studious work look. I love all of your looks! So comfy. You and your daughter as such cuties! i like the casual real life outfit posts you're doing, katie! I have to give you credit for waking up early enough to take outfit photos before work. I'd love to do it myself, but I find I'm always in a hurry. 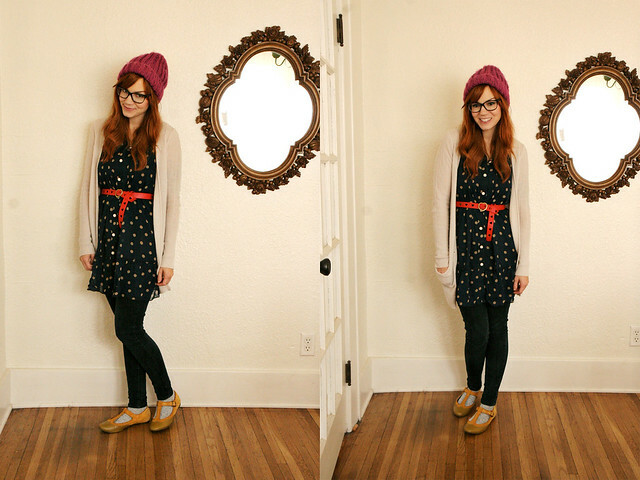 Love this adorable outfit - especially the shoes! wow you look so adorable <3 your dress is wonderful and i'm in love with it. My one year old, Jarvis, has learnt how to do cute and to flirt already. Head tilt to one side, half smile and then blows a kiss. My question is how do they learn this so early? haha- I have no idea, but it sure is adorable!